Time to do a deck rebuild, this time with composite material. Lots of work but it looks great and should be maintenance free. I have never enjoyed the annual ritual of deck maintenance. Traditional wooden decks need to be re-stained or painted every one or two years. In an effort to avoid this work, I had a Duradek surface installed eight years ago. This is waterproof vinyl material providing a solid surface, glued onto plywood. I was never that happy with Duradek. Right away it started to peel at the edges and seams. Pretty soon it started to stain. So, we decided to re-do the deck this summer. This time, our money went into composite decking. This is a man-made product made from recycled wood fibers and plastic. According to industry information, composite decking is stronger than wood and more durable. Best, it requires very little maintenance, other than washing with soap and water. It “sort of” looks like wood, but clearly is not. It is heavier more expensive than wood, but will not rot. Newer materials have a 25 year fade and stain warranty. In Alberta, a good source of ideas is The Deck Store. We began by considering how much work was needed in the deck rebuild. The underlying framework was probably still in good shape, but we were prepared for a bit of repair, if needed. Also, we wanted to make the surface slightly bigger. So, I designed a new deck surface in CAD using Sketch-Up. The area of the new deck would be 275 square feet, up from 230. For composite material, we selected Trex and ordered it from Home Depot. We eventually agreed on a grey color: Trex Enhance Capped and Grooved Clam Shell. The service representative at Home Depot was able to copy my CAD design into his software, which produced a pretty accurate bill of materials. Total cost for decking, fascia, hardware and some extra lumber was around CAD$ 4,000. The boards were available in 12, 16 and 20 foot lengths. Everything was delivered to my home in around ten days. Tearing down the old surface was hard work, especially removing old screws that had been sunk beneath the surface. A few minor repairs and some additional framing, and we were ready to install the Trex. The new hidden fasteners make it easy to lay down the composite boards without worrying about spacing. The new deck was installed on a weekend, and the whole project from order to completion was done within three weeks. Now I was really lucky. A couple of friends with experience in this type of work “helped”. This means they did the hard, skilled work, and I was an extra pair of hands. I will have some landscaping to do next spring. 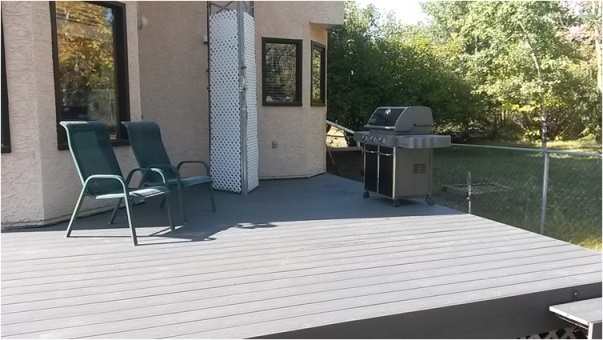 But in the meantime, the new composite deck is built and ready for use during the winter barbecue season. In case you did not notice, yes, my ham radio tower is indeed built up through the deck!